Exploring more than 100 of the most important ideas, organizations, and events to have defined the feminist movement, this is an essential introduction to feminism. The latest entry in DK's bestselling Big Ideas series, The Feminism Book is a complete study of feminism. Trace the subject from its origins, through the suffrage campaigns of the late 19th century, to recent developments such as the Everyday Sexism Project and the #MeToo movement. Examine the ideas that underpin feminist thought through crucial figures, from Simone de Beauvoir to Chimamanda Ngozi Adichie, and discover the wider social, cultural, and historical context of their impact. Find out who campaigned for birth control, when the term "intersectionality" was coined, and what "postfeminism" really means in this comprehensive book. Using the Big Ideas series' trademark combination of authoritative, accessible text and bold graphics, the most significant concepts and theories have never been easier to understand. 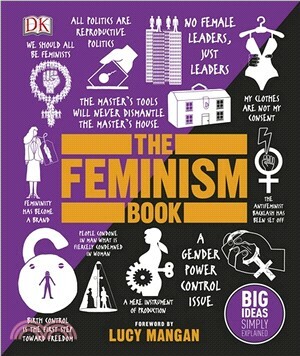 Packed with inspirational quotations, eye-catching infographics, and clear flowcharts, The Feminism Book is a must-have for anyone with an interest in the subject.